Rick Buehrer told the Stryker Rotary Club about the work of the Gideon’s in the local area as well as abroad. Each local group in Ohio is referred to as a camp, and there is at least one camp in each of Ohio’s eighty-eight counties. The Gideon’s are an association of Christian professional business and professional men who were founded in 1899. Their work includes personal witness and the distribution of God’s Word. Today the Gideon’s distribute one million bibles every week but it took the organization 31 years to distribute the first million scriptures. They are in 196 countries and just last year collected over 120 million dollars that was used to purchase and distribute 86 millions copies of the Bible. They also print the Bible in about ninety different languages. 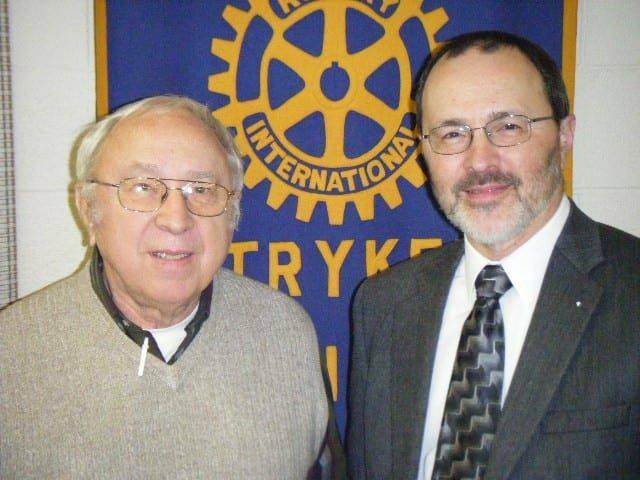 Rick, pictured on the right, spoke as a guest of Stryker Rotary member and father Eldred Buehrer. Be the first to comment on "Rick Buehrer Of The Gideon’s Guest Speaker At Stryker Rotary Club"